When it comes to redesigning spaces in our homes, the reality is most of us can’t change everything at once. We do it in phases. Maybe you start with a room or two with the hopes of tackling future spaces down the road. The first areas that usually get attention are the public spaces - living rooms, dinning rooms and family rooms. That’s what most of your guests will see. Fair enough. But then our busy lives get in the way and that second project – the beautiful master bedroom you’ve always dreamed of – gets put on an indefinite hold. I say it’s time to “un-pause” that follow-up dream project! This is exactly what we did for a lovely couple in North Arlington. Our clients had completely decorated the first level of their wonderful home but their second floor really needed some TLC. We wanted to create a relaxing, rejuvenating, retreat for their master suite - a place where they could escape and indulge in a little self-care. Since the bed is the first thing you see when you enter the space, we wanted something impactful. We designed a tall tufted headboard with wings and flanked it with custom gold leaf artwork to balance the wall. The bedroom had wall-to-wall carpeting, which our clients wanted to keep. We overlayed a hand made rug under the bed to add a luxurious focal point and to separate the sleeping area from the sitting room area. To create a calm feeling with color and layers of texture, we added decorative curtain panels in patterned linen over the plantation shutters, grass-cloth wallpaper in a soft spa blue and metal accents for a little glam throughout the space. The clients’ own armoire was renewed with paint and new hardware (what a difference!). We added a small-scale chair and ottoman to create a sitting area in front of the fireplace and TV. We reimagined the fireplace area with a new marble hearth and tile, building out the trim to balance the proportions, and spruced up the shelves with new paint and styling. 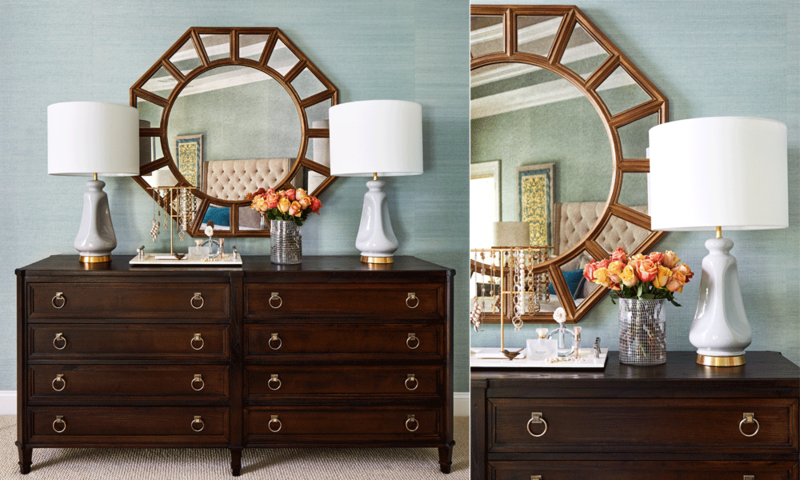 A large, dramatic mirror tops the new dresser, along with these elegant ceramic lamps. To complete the second floor transformation, we also redesigned the upstairs hallway and the home office, using a complimentary palette and style to connect all the spaces. Want to see more? Visit our Projects section for more pictures!